Who doesn’t love bread? Who doesn’t love pasta? Well if you’ve got some old bread that you hate to see go to waste and some pasta in the house, here’s a classic Italian recipe for you. This pasta dish is easy and delicious while not tossing out that old bread or feeding it to the birds (although feeding it to the birds is OK too)! 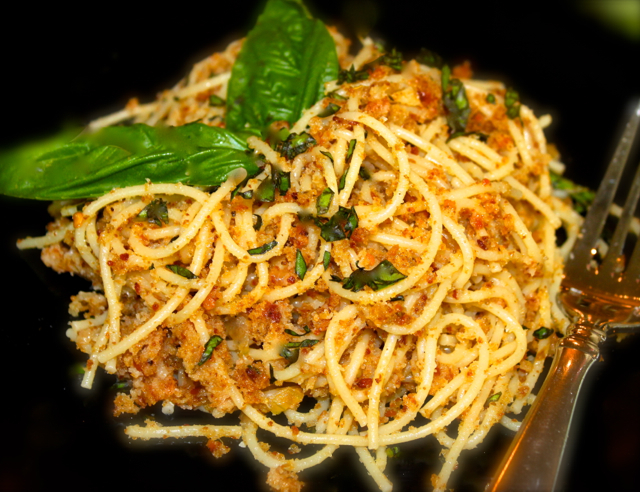 Spaghetti with Toasted Garlic Breadcrumbs is a delicious and economical way to use them in an entree! Or maybe you’ve been looking for some new meatless, yet tasty and filling recipes? This recipe is for a mild-flavored pasta that is seriously ‘cucina povera’ (food of the poor). You’ll never find this on a menu in a restaurant, that’s for sure! This dish has a delicious and pleasing crunch with the toasted, garlic-y breadcrumbs plus a tiny bit of heat with the dried red chili pepper flakes (of course if you don’t like heat, you can eliminate the chili pepper flakes). Many people add anchovies (which I love, but my husband does not), so it’s any easy recipe to add whatever you like, even green and/or black olives have been added to this pasta. To add more of an intense flavor to this mild-flavored pasta, blend in some basil pesto to the taste level that you or your guests prefer (store-bought is OK too; here’s an easy link for pesto). My husband isn’t a fan of pesto, so he doesn’t add any it at all. Me, on the other hand? I just love basil pesto, so I really enjoy amping up the flavor with it. I’ve provided a link ‘fresh basil pesto’ to take you directly to the recipe and the how-to’s of making home-made basil pesto. This pasta recipe is from the Southern Italian provence of Calabria and is quite common in the ‘toe’ area of the boot-shaped country. As I mentioned above, it typifies the foods prepared by those who could not afford other ingredients, thus it is truly peasant food. This meatless dish is traditionally eaten on Fridays in Lent and/or Christmas Eve in Italy when Catholics are not supposed to eat meat. Being close to the sea, anchovies are commonly added in Calabria. If you love anchovies as much as I do, always buy the best imported anchovies that you can find. Here’s a link to help you buy Italian anchovies. While on the Amalfi Coast, I bought the freshest and most delicious anchovies fresh from the sea! Oh my goodness, I cannot tell you what a difference it makes to buy the real deal that is so straight out of the sea FRESH! 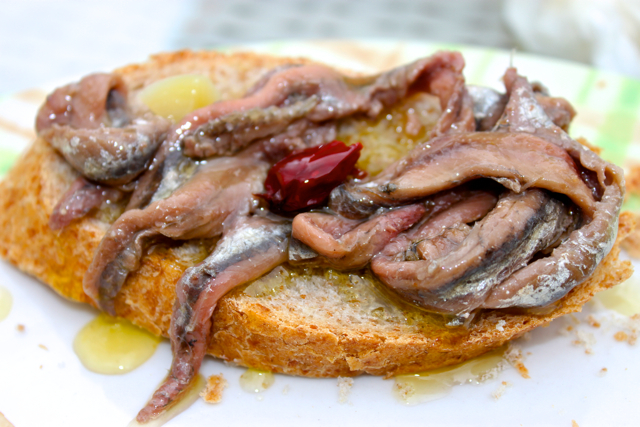 Incredibly delicious crostini with fresh anchovies in olive oil enjoyed on the Amalfi Coast, Italy! Take a dried out loaf of bread (in this case I used some dried focaccia bread). This foccacia was already seasoned very nicely! 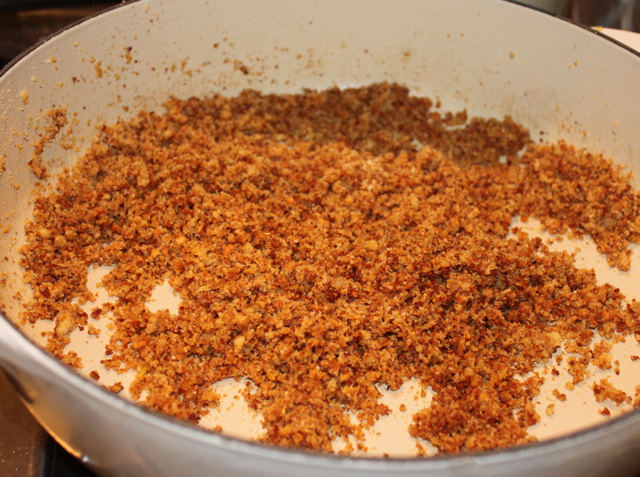 Using a food processor, chop the bread until nice breadcrumbs form. .And now here is the full recipe for you; remember to always add more or less of any ingredient to suit your taste preferences! TThis is one of my most popular recipes of all times and has been pinned over 10,000 times. We hope that you enjoy it as much as our family and friends do . . . it’s truly a classic Italian recipe that we’re sharing with ‘amore’ from our cucina and acreage to you. Authentic Spaghetti alla Carbonara, a Roman Pasta Tradition! I’m going to be very clever with my response to this …. YUM! So simple and so delicious. I’m swimming in pesto right now, so would definitely mix some of that in. Looks so good Roz. Simplicity seems to never fail when it comes to pasta, Lea Ann! Just a dab of pesto is all it takes for declisousness! This sounds like the perfect pasta for a busy weeknight and I always have some bread that needs to be used! It is super easy too Pam! An old classic recipe that has very humble beginnings. Color me a peasant – I know I would love this dish and absolutely with the anchovies. I’ll do the same Larry! Anchovies always make a recipe so much better! Oh my Goodness! WE LOVE this dish! This is my husbands absolute favorite, instead of anchovies they add fresh sardines -of course he is from Sicily! Lol….. they call this dish ” pasta con sarde” <3 !! Oh yes, if your husband is from Sicily, then I’m sure that both of you not only love this dish, but also know how to prepare it much better than I do! I didn’t know what the official ‘name’ is for it, so I’ve learned something new! Oh yes … a gorgeous pasta fix, here! Good job bringing us such a simple, economical, and totally killer carb fix, Roz! I was thinking the same thing Susan, this is a carb buster alright! Hi Betty, it’s a very easy supper recipe with or without anchovies! Enjoy! This looks perfect for an easy summer supper. I’m so glad you mentioned to buy the best anchovies you can find. That is just so true and there is a world of difference in quality in the world of anchovies. Sam, I agree that whenever possible to always buy the best ingredients that make an incredibly big difference! I am seriously HUNGRY! This looks so Italian and delicious! Thanks Angie, it is humble, it is mild, and it is yummy! Oh my…looks scrumptious! This is definitely going on this weeks menu, as your recipes never let me down! You are so sweet and so very gracious in this comment Nancy! Thank you so much! I really appreciate sharing all of my recipes with you! LIke you, Liz, I prefer the added zip of pesto in this very mild pasta dish . . . it’s a classic though. Great for meatless recipe lovers! You’re right Jessica . . . somehow poverty brings the most ingenious recipes simply from necessity! As a mostly non-meat eater, this pasta is perfect, Roz. I am delighted, too, that I now have a delectable remedy for the bread that has been in my freezer a tad too long. I need to include more meatless meals in my nutrition for a variety of reasons! I love the anchovies too! Oh Rochelle, whenever I have old, stale bread around, I think of ways that I can use it up in a good recipe and this one’s a classic, old Italian recipe. Thanks for your kind comment! Hey Lisa, I, too, am enjoying more meatless recipes! I’ll be right over to check out what’s going on in your cucina! Terrific photos. I love this simple but flavorful dish. I’m like you, I like anchovy added to the dish for a nice depth of flavor. 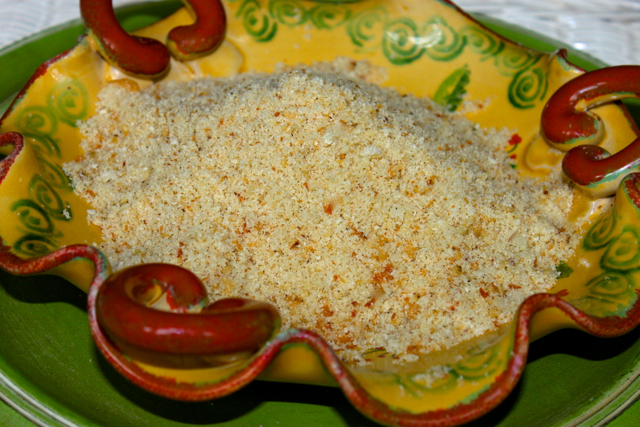 I first topped pasta with flavored breadcrumbs last year after reading a post on another friend’s blog. I loved it. 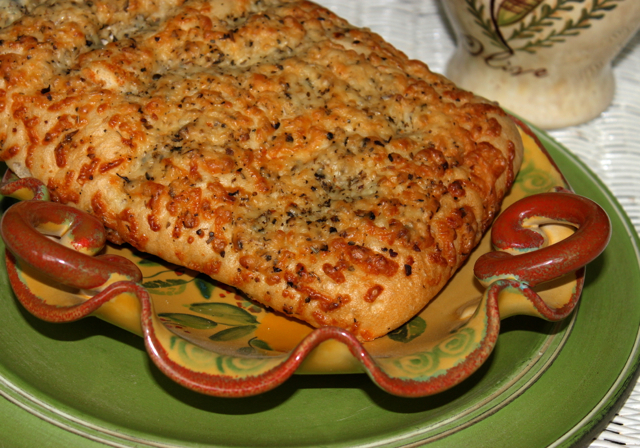 What a great way to repurpose stale bread! I’m a pasta lover. I’m adding this to my “fast food at home” list. This is a classic way to prepare pasta in an inexpensive way. I hope you enjoy it if you try it Debby! 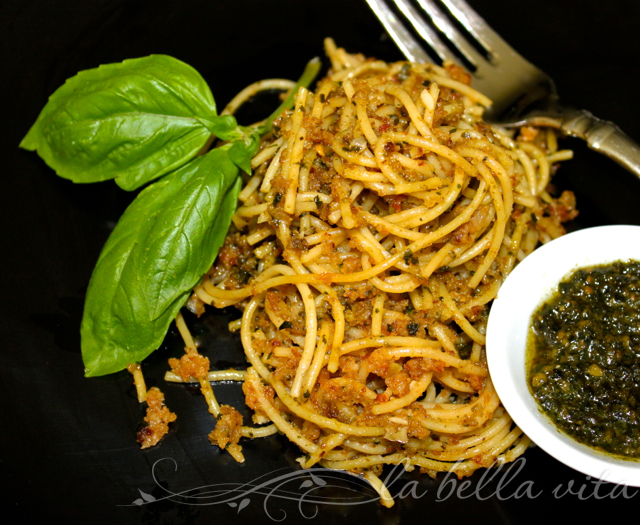 I just printed out your Spaghetti/Breadcrumb recipe and yes, I will serve this with pesto to night – merci! Love your recipe here…it’s become a favorite in my home! Thought you would find it interesting that a new restaurant opened nearby….”Gigi’s Cucina Povera.” Lots of amazing Sicilian dishes incorporating these ingredients! My grandmother use to make this. She was from Sicily. She called it pasta con sarde. They called it peasant food. Restaurants will charge $20 a plate!! Imagine that! Hi Roz, I just had to let you know I made this for dinner tonight, and my husband and I absolutely loved it! We loved the garlic and red pepper in it. It was so flavorful. The only problem was it made a lot, and I wanted to eat the whole bowl! It was hard to make myself quit. It is such a unique recipe from what we are used to, but it is going to be a regular one now. Thanks so much for sharing it! I’m from an Italian family in Louisiana and I grew up eating the toasted bread crumbs on top of my spaghetti. I was always told it was called madika. Although none of us know for sure the spelling of it I was wondering if anyone knew exactly how it is spelled and if their family has called it the same thing. Hey Dawn, it’s spelled Muddica- means breadcrumbs. Grew up on them, too. It was also called ” poor man’s cheese” because some families couldn’t afford cheese. Thank you for this clarification Mick! I hope that you have a wonderful new year!!! Thanks Dawn! I love this classic Italian dish too! Thanks for your visit! Have a Happy New Year! Simple but delicious is always best!! Oh Roz…I am definitely going to be making this!!! We love simple pasta dishes and this one is perfect! Thanks so much for sharing. I love this beautiful pasta dish, Roz. I wish I could find some of those lovely, fresh anchovies here to try! What a lovely pasta dish Roz! 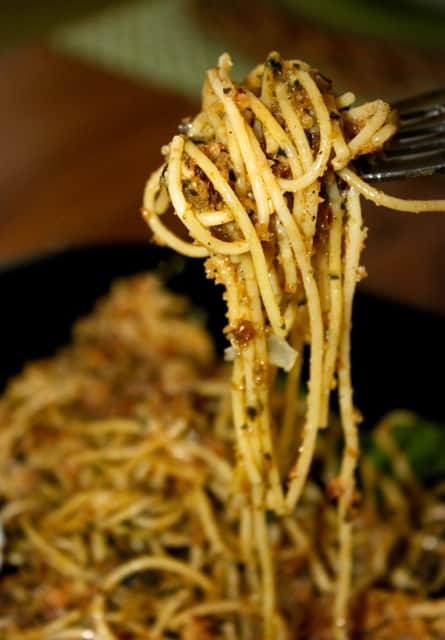 I love pasta with crunchy breadcrumbs, it is so addictive! A beautiful Italian dish indeed. Roz, This is such a beautiful and delicious pasta dish! My grandmother (from Calabria) made it often, and it always hit the table on Christmas Eve with the feast of Seven Fishes. Thank you for the post….it brought back many great family memories! I’m so glad to read that this recipe brings back such wonderful memories of your grandmother! What a wonderful compliment! 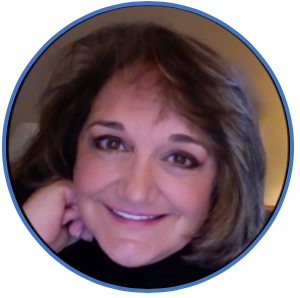 I hope you stop by again to visit and to keep in touch as well! Where are the anchovies!? I will definitely add some to this recipe; I buy them at an Italian supermarket. My basil is ready to harvest and I have a bottle of seasoned olive oil – a gift from my sister. I love anchovies, but sadly my husband doesn’t. I mentioned that it is popular to add anchovies in the post. I’m sure your addition of those awesome little fish will be awesome!!!! I had them when I was in Amalfi and they were straight out of the sea. Magnificent!